What will Queen Elizabeth make of her cricketers? The Queen is coming to call on us, to paraphrase a line from a Dubliners song about the Phoenix Park and the notorious Monto area of Dublin that my late and great granny used to sing at family gatherings at a time when Double Diamond still worked wonders. Now, I understand that most of you reading this in New York have probably never heard of Double Diamond, but it was a very popular bottled beer in times of yore, something like former Taoiseach (Prime Minister) Bertie Ahern’s beloved Bass Ale if memory serves me right. The chances are you also won’t remember the bakers Johnston, Mooney and O’Brien, who used to deliver the bread to our house in an electric van when bread was white, brown or batch, and rye was only to be found in the title of a very famous book. Yes, I am getting nostalgic here, and no, I’m not old enough to remember the last visit to these shores by an English monarch, all of 100 years ago as it happens. What I do know is that the queen of England will find an Irish public ready, willing and able to talk about one of her cherished interests when she lands in the Phoenix Park in May, though probably not in the big balloon of my granny’s party song. Cricket, you see, is all the rage among the chattering classes in Ireland this week. Why? Because we beat England in the World Cup, of course, and all thanks to a wonderful man called Kevin O’Brien and his historic innings in the Indian city of Bangalore on Wednesday of last week. O’Brien, who hit the fastest century in World Cup history as Ireland carved out a quite unbelievable win over the nation that invented the game, was aided in his quest by Trent Johnston and John Murray -- hence the Johnson, Mooney and O’Brien headlines in many of Thursday’s papers. Between them those who wore the green in India struck a blow for Irish cricket and for Ireland last week, at a time when the country badly needs any boost we can get. That they beat England in the process -- a result I can only compare to that breakthrough moment when Ray Houghton stuck the ball in the English net in Stuttgart in 1988 -- made it all the sweeter. There are so many reasons why Irish people celebrate a win against England more than any other in the world, too many reasons to go into here. But a little story from Bangalore, as relayed by my old mate Emmet Riordan in The Irish Times, and lifelong cricket fan Ger Siggins in the Irish Independent, will give you an idea why this win was as special as Stuttgart all those years ago. At halftime in the cricket, after England had scored 327 runs in 50 overs, their players sent out for four crates of Kingfisher lager to put on ice in their dressingroom ahead of their expected win. 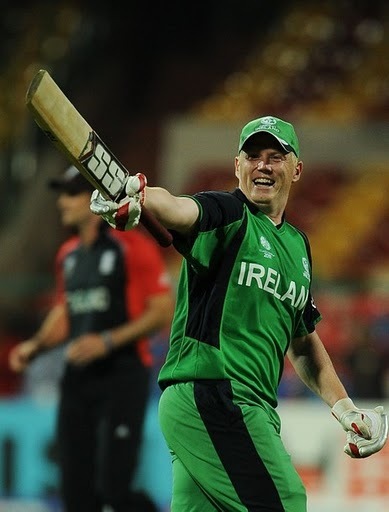 The fact that the dressingrooms shared an entrance in the Bangalore Stadium ensured the Irish team saw the celebratory lagers arrive -- nbefore they had even gone out to bat. Thanks to O’Brien’s incredible century, the boot was on the other foot and the beer was needed in the other dressingroom by the time the players from both sides returned from the field five hours later. The story highlights the sort of arrogance England brought with them to this cricket World Cup in one of their former colonies. They took it for granted that we would roll over and die in cricket terms, but Johnston, Mooney and O’Brien had other ideas and delivered. The English arrogance also explains why this little corner of their once glorious empire is still laughing at them. And you can bet your bottom dollar that someone, somewhere in Dublin this summertime, will mention the cricket to the Queen come May. I look forward to her reply. Rory McIlroy is known for telling it as he sees it. It’s a trait that is one of the joys of the youth that he currently enjoys, and one which partly explains his recent dismissal of Tiger Woods this week as a golfer playing some very “ordinary” golf. McIlroy is right. Tiger, on current form after his annus horribilis, is playing some very, very ordinary golf and displaying some very unacceptable mannerisms on the golf course as recent spitting incidents would suggest. Clearly, Tiger is not the force he was when McIlroy was still a bright eyed kid at his family home just outside Belfast and glued to the television every time Woods appeared in a big tournament field. In those days, Tiger had one hand on the trophy the minute he appeared on the first tee – but these days there’s a queue of young pretenders to his throne standing the queue ahead of him, McIlroy included. That partly explains why McIlroy has dismissed Tiger’s current form and wondered publicly if he can ever dominate world golf again. A more reasoned barometer of Tiger’s current standings may come from the considered response of current world number one Lee Westwood, when asked about McIlroy’s dismissive remarks. “That’s the answer a 21-year-old would give -- 37-year-olds are a little wiser,” observed Westwood. “Having played with Tiger since 1997, there’s an old saying that class is permanent and form is fickle -- and he’s the classiest player I’ve ever played with. McIlroy may well be right about Woods in the long run, but don’t be surprised if the Tiger bites at Rory’s heels in the short term. SOCCER: You couldn’t blame Neil Lennon if he walked away from Celtic this summer, but I doubt he will. The man forced to quit the Northern Ireland team by sectarian abuse some years ago now has 24 hour police surveillance after another suspect device was posted to him from his native land. Lennon doesn’t help himself at times -- witness his sideline spat with Ally McCoist last week -- but his current life in Glasgow can’t be worth living. The fact he is so committed to the Celtic cause may keep him at the club next season, but something will have to give off the pitch for the sake of his family and their sanity, if for no other reason. SOCCER: Alex Ferguson imposed a media ban before and after his team’s 3-1 defeat at Liverpool on Sunday which is an awful pity -- I’d have loved to have heard his reaction to Jamie Carragher’s savage tackle on Nani which deserved a red card at the very least, but got only a yellow from another inept referee. Carragher waited outside the United dressingroom to apologise to the Portuguese winger, but his actions spoke louder than words on this occasion. It’s just a pity we didn’t get to hear Fergie’s words on the subject. RUGBY: Anyone else notice how little is being made of Ireland’s Six Nations trip to Wales on Saturday? Interest levels are fairly low at home. Maybe the focus has been on the cricket team all week, which has to be a worry for the IRFU. In this World Cup year of all years, they could do with a convincing win in Cardiff to re-ignite Ireland’s season and set the stall out for a Triple Crown showdown with England at the Aviva on Saturday, March 19. AS a nation, we owe an apology to the good people of Wales and Scotland for our partisan hollering and cheering when England were beaten by Ireland at cricket’s World Cup in India last week. More than one tabloid dedicated its front page last Thursday to a spot of Brit bashing in celebration of Ireland’s quite incredible win. Kevin O’Brien became cricket’s Ray Houghton last week. He put the proverbial ball in the English net and we all celebrated. Britain may be great at many things but cricket isn’t one of them right now. Ha ha! THE Rangers coach Ally McCoist told Neil Lennon to stop picking on his players when they squared up to each other at Parkhead last week. The Celtic manager told McCoist to stop buying idiots like El-Hadji Diouf. He has a point. Diouf was a constant embarrassment during one of the most volatile Old Firm derby games ever, but not even a red card after the final whistle could calm him down – he then had to go and throw his jersey to the Rangers fans, a provocative act at the best of times. The policeman who tried to keep Diouf away from those visiting fans should now throw the book at him.